NPR fact-checked both President Trump's State of the Union address and the Democrats' response delivered by Stacey Abrams. 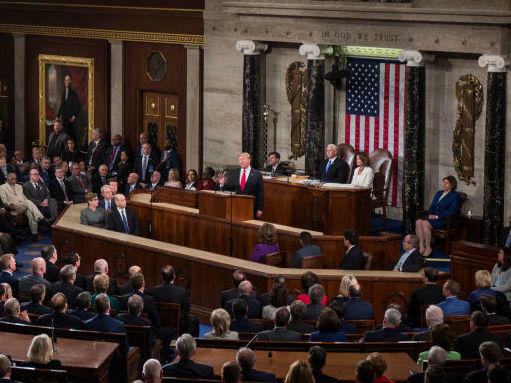 NPR rolled out its labor-intensive process of almost simultaneous fact-checking on Tuesday night for President Trump's State of the Union speech. It also checked Stacey Abrams' Democratic response. These fact checks of major speeches and debates by U.S. politicians have become a welcome staple of NPR's political coverage since October 2016, when NPR first started the practice. I say "welcome" because these fact checks are generally well done. They are a public service for news consumers trying to separate out the realities from a sea of political rhetoric and remain highly popular with the NPR audience. Another reality of our civic dialogue these days is that news media fact-checking, and not just NPR's, has become a target for those who choose to see political motive behind every news story. My office heard from readers who complained that only the president's inaccuracies were flagged, not the accurate statements. Well, yes. There's an assumption that our political leaders base political policy and statements on facts. This president has a poor track record on that, as The Washington Post and others have well documented. That is a major reason why fact-checking has become such a vital tool for newsrooms seeking to provide accurate information and debunk falsehoods. But that baseline assumption remains. While some newsrooms do regularly flag facts as "true," as opposed to "false," I don't think NPR needs to constantly do so. I use the word "annotations" to make the distinction that not all the information added is an actual clear-cut yes or no on the facts. A fact can be factually correct but also misleading or lacking adequate context. So the newsroom just as often adds context so that readers can understand the fuller picture. I think most readers understand this, even if a few choose to take the words "fact check" literally. Beth Donovan, NPR's senior Washington editor, told me that adding context was the reason behind an annotation that came in for some Twitter ridicule Tuesday. When the president praised the current record number of women in Congress, NPR noted that most of those women are Democrats, not Republicans (the president had said nothing about which party had elected the most women). When that individual annotation went out on Twitter as a "Fact Check," it came across as a cheap shot to some. "It wasn't intended as such," Donovan said, adding that it "was not inaccurate. Our fact checks are designed not only to observe what's wrong, but sometimes what's right and they always add context." Are NPR's fact checks always perfect? No, but they strive for accuracy and "we do our best to be thorough," Donovan said. My office also heard from a few people who saw political motivation in a statement of Abrams' that NPR did not call false. Abrams said: "The Republican tax bill rigged the system against working people. Rather than bringing back jobs, plants are closing, layoffs are looming and wages struggle to keep pace with the actual cost of living." AP ruled that inaccurate, as did Politifact, while NBC had a more mixed reaction. NPR should have flagged that one, in my opinion. Overall, however, the effort was commendable and I hope NPR continues to do this intensive work.